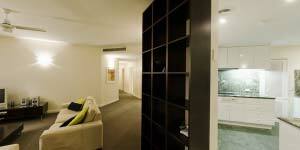 The Emerald Resort Noosa features 1, 2 and 3 bedroom apartments, all of which are self-contained. It’s only footsteps from the finest restaurants, galleries and boutiques Noosa has to offer. The Emerald Resort is located on the world renowned Hastings Street in Noosa, Sunshine Coast. This 4 ½ star property features 1, 2 and 3 bedroom apartments, all of which are self-contained. Noosa’s restaurants, boutiques and art galleries are only footsteps from your apartment. The wildlife and natural beauty of Laguna Bay and the Noosa National Park are a short walk away as well. Each apartment features a well-appointed kitchen with a cook-top, microwave and a full-sized fridge. It also features a living area, separate bedrooms and bathrooms, a laundry and a spacious balcony. It’s the perfect spot to entertain family and friends! Each apartment has 1 undercover car park and complimentary wifi access included (at no additional cost). Resort facilities include a heated outdoor swimming pool, spa and sauna. These luxurious self-contained apartments will enable you to enjoy the sun, surf and luxury of Noosa. 35 minute drive from the Sunshine Coast Airport. 1 hour and 50 minute drive from Brisbane. High season - If the booking is cancelled 28 days or more prior to the planned date of arrival. An administration fee of $100.00 will be deducted from the deposit held before the remainder is refunded. If the booking is cancelled less than 28 days prior to the planned arrival date there will be no refund unless and until the premises are re-let for the total period of the original booking. An administration fee of $100.00 will be deducted from the deposit held before the remainder is refunded. Mid and low season - If the booking is cancelled 14 days or more prior to the planned date of arrival there will be a full refund less an administration fee of $100.00. total period of the original booking. An administration fee of $100.00 will be deducted from the deposit held before the remainder is refunded. Short notice bookings - Where a booking is made less than 14 days prior to the planned arrival date there will be no refund unless and until the premises are re-let for the total period of the original booking. An administration fee of $100.00 will be deducted from the deposit held before the remainder is refunded. Two Bedroom, Two Bathroom spacious fully self contained apartment. Beds can be made as 1Queen & 2 Single or 1Queen & 1King. Two Bedroom, Two Bathroom recently renovated spacious apartment. Fully self contained spacious 2 bedroom, 2 bathroom apartment. 1 queen & 1 King. Two Bedroom, Two Bathroom fully self contained spacious apartment. Recently renovated two bedroom fully self-contained spacious apartment. Three bedroom, 2 bathroom recently renovated self contained apartment. All beds can be made as single or as king.